Gandhinagar, Dec 22 : Hundred of the over 600 Indian fishermen held in Pakistani jails will be released soon, a fishermen's forum official said here Tuesday. Manish Lodhari, secretary of the National Fishworkers Forum (NFF), said from Porbandar that Sami Memon, secretary general of the Pakistan Peoples Forum, had apprised him of their government's decision to release the fishermen. The bulk of these fishermen are from coastal areas of Gujarat, picked up while they were engaged in fishing, taken to Karachi and their boats were seized. Lodhari told IANS from Porbandar said that further communication announcing the names of the fishermen to be released was awaited. 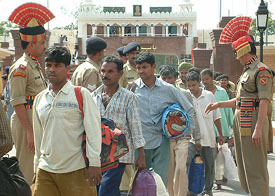 The Indian fishermen would be released at Wagah border and would then come to Veraval near Somnath by train, he added. The Pakistan Maritime Security Agency (PMSA) had a week ago picked up eight Indian fishermen and seized four boats in the Arabian Sea off the west coast of Kutch.